Rising to an altitude of 16,475 feet (5,023 meters), the Tungurahua Volcano towers over the surrounding terrain in central Ecuador. 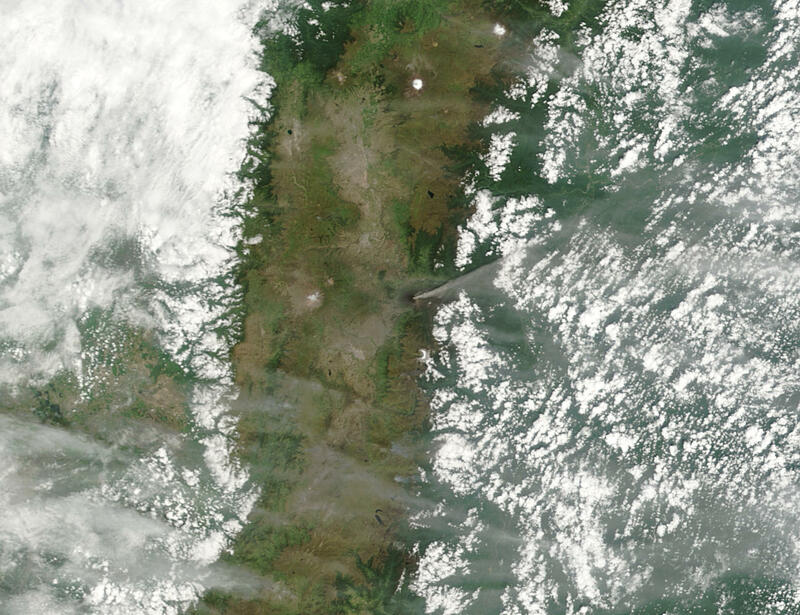 From this Moderate Resolution Imaging Spectroradiometer (MODIS) image from the Terra satellite, it’s easy to see why this volcano (center) is also called the “Black Giant”—its flanks are coated with dark lava flows. In this scene, captured on January 14, 2003, a plume of ash is rising from the volcano and is stretching northeastward across the Andes and the lower elevations to the east. According to reports from the Smithsonian’s Global Volcanism Program, Tungurahua began erupting with plumes of ash, steam, and smoke at the end of December 2003, and has continued into the third week of January 2004. Some of the haze visible amid the clouds to the south of Tungurahua may be the remains of smoke and ash plumes from Ecuador’s larger Sangay Volcano, which was also reported to be erupting with small ash plumes during this period.